Bolivia hasn’t always been a landlocked country. Many years ago, its borders stretched all the way to the Pacific Ocean, occupying a vast desert landscape once known as Litoral. Sadly, Bolivia lost its precious coastline to Chile in one of the most bloody South American conflicts in history: The Battle of the Pacific. In the early 1800’s, Chile, Bolivia, and Peru were in the process of forming independent nations after the fall of the Spanish Empire. But it didn’t take long for the new countries to start bickering among themselves, with tensions starting to build over various political and economic disputes. The arid deserts of Litoral are the perfect climate to preserve vast quantities of Potassium Nitrate (used in explosives) and Guano (bird poo fertilizer). Chilean mining companies had an agreement with Bolivia to exploit these precious resources in return for a share in the profits. However, the Bolivians obviously felt that they were getting a raw deal so in 1878 they decided to add a ten cent tax to every 100 pounds of resources extracted by Chile. Ten cents was a fair bit of money back then so the Chileans were seriously unimpressed, largely because a few years earlier Bolivia had promised they would not raise taxes for another 25 years. Rather than graciously accepting the new tax and broken promise, Chile declared war. In February 1879, while Bolivia was busy drinking and dancing for Carnival, Chilean troops invaded the port city Antofagasta. Met with little resistance, they were able to take the city with ease. Bolivia sent troops to defend their territory (presumably after their hangovers had subsided) which culminated in a battle for the city of Calama on March 23. But Chile vastly outnumbered their enemy with 554 soldiers to 135, easily winning the battle. Chilean troops then surrounded the defeated Bolivian General, Eduardo Avaroa, to demand he surrender. Avaroa famously replied “Me surrender? Tell your grandmother to surrender!”. He was subsequently shot dead and the day has since been known as El Dia del Mar throughout Bolivia. But the War of the Pacific wasn’t over yet. Chile warned Peru not to get involved, urging them to sign a treaty declaring neutrality. Peru considered their options, but ended up siding with Bolivia because they already had a secret treaty promising military assistance in these kind of situations. Despite this new alliance, Chile still had superior military power and dominated Peru so severely that they eventually reached and occupied the capital of Lima. Once Bolivia and Peru knew they had been defeated, they signed separate peace treaties with Chile. Bolivia’s treaty relinquished the entire Bolivian coastline in exchange for Chile constructing a railway line between Arica and La Paz, a railway that has sadly since fallen into disrepair. Almost 150 years later, El Dia del Mar is still observed across the country and remains a sore point for many Bolivians. 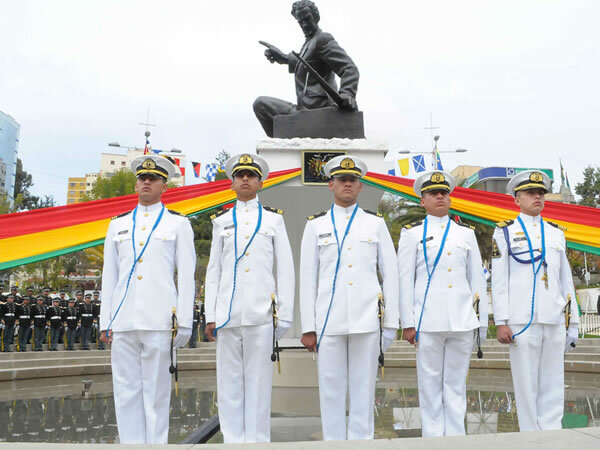 Huge patriotic parades are held in all major cities featuring displays of national pride from the Bolivian Navy. Government relations between the two countries are tense at the best of times and there is a general feeling of distrust among opposing citizens. Many Bolivians still long for the sea so Morales’ government is taking steps to reclaim lost land through the International Court of Justice, the primary judicial branch of the United Nations located in The Hague, Netherlands. Why does Bolivia make such a big deal out of a coastline lost so many years ago? Many of the parades are ultimately to sooth an injured national pride. To put it simply, Bolivians don’t like to think they were outsmarted and overpowered by their Chilean counterparts. Having said that, there are significant economic advantages in reclaiming lost land. While guano can now be cheaply synthesized and Potassium Nitrate is not as sought after as it once was, there is still untold wealth in the form of copper and other minerals hidden underneath the barren desert floor. 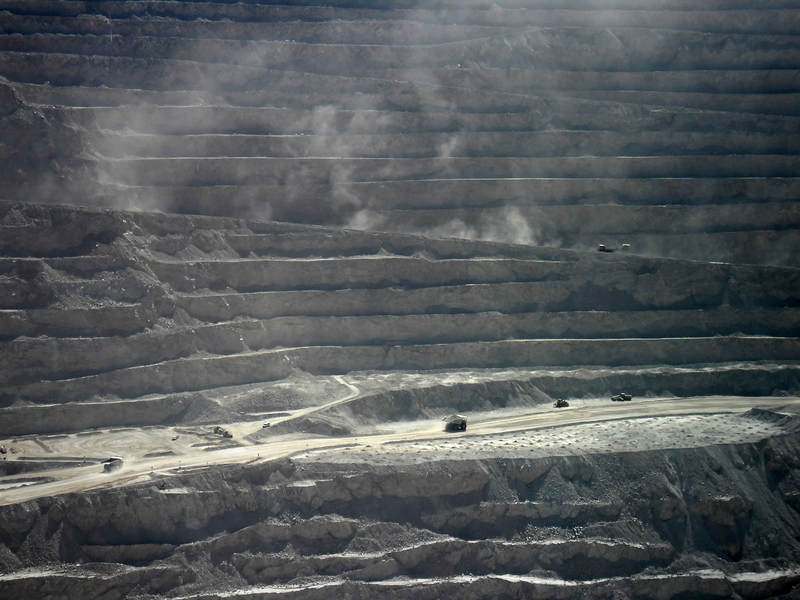 Chucuicamata near Calama, for example, is the biggest open cut copper mine in the world. In fact, Chile’s prosperous economy depends heavily on the resource rich lands of the north. It’s fairly certain that Chile isn’t going to give away their country’s most valuable land without a fight but they could possibly one day share a slice of their seemingly endless coastline. This would make Bolivians very happy, though not for the prospect of a beach vacation, considering the beaches of northern Chile are cold, ugly and often overcast. The economic advantages of having direct access to the shipping routes of the Pacific cannot be underestimated. Many goods are very expensive in Bolivia because they have to be imported through neighboring countries while exports would be much more profitable if the country had it’s own seaport. President Evo Morales wants the International Courts to rule the invasion illegal and order Chile to return occupied land. In reality, even the most patriotic Bolivian knows this is wishful thinking. The conflict far out-dates UN and international law, not to mention the existence of an undisputed, signed legal document legalizing the handover of control to Chile. And even if the UN were to rule in Bolivia’s favor, it’s unlikely that Chile would comply without military intervention. Nevertheless, on March the 23rd every year, Bolivia continues to pay homage to the war they lost and dream of one day having a coastline of their own. Harry is a freelance writer based in South America who writes about travel among numerous other things. This entry was posted in history and tagged battle of the pacific, Bolivia, chile, day of the sea, dia del mar, Evo Morales, history, politics. Bookmark the permalink. A few side notes on the matter my dear friend. First of all there was no “shared profit”, as it just so happens chilean mining companies exploited the area without as much as a “how do you do” and since (a long standing problem sadly) Bolivia had never set a real presence in the border there were pretty much as many chileans as there were Bolivians living in the Litoral. Second, Peru HAD to join in because they had a longstanding agreement of mutual defense. Bolivia and Peru had (and it is my understanding they still do) a pact to defend each other against any and all aggression from the dawn of both republics (this actually dates back to when they were fighting their way out of the Spanish Crown). Third, the actual issues started some 10 years before the invasion and thus Chile (wisely) strengthened, largely I must say, their military power. In just eight years they “ten-folded” their numbers on active military and reserve and, unspokenly, armed themselves with an english speaking ally far up north but directly above them (mainly because they were their biggest customer for guano and salitre at the time). Fourth the treaty of 1904 is sadly misinterpreted and thus allows many a person to fall into wrong conclusions. It was also forced upon Bolivia and may lead to different positions among either part. With all that said it is true that Bolivians long for an independent and sovereign path to the ocean and mainly due to the economical problems that arise from being landlocked. It is also true that Bolivia was outsmarted in an invasion and thus lost not due to it’s lack of courage but due to the incompetence of it’s government (long before the fighting actually started), incompetence we have seen repeatedly war after war throughout the history of the country and that is sadly still as real in preset times as it was before. Let me correct something I seem to have mistyped, the ally they armed themselves with was “far up north but NOT directly above them”. Thanks for stopping by again Gabriel and for the well thought out comment. I wouldn’t be surprised if Chile was taking the majority share of the profits from exploiting resources in the region. Nor would I be surprised that they increased their military spending by such large quantities in the lead up to the conflict. It seems Chile knew exactly what they wanted and how to get it, without too much concern for neighbouring relations. I did notice in my research (mostly from wiki) that Peru had a secret treaty with Bolivia to offer military support should such a situation arrive. But given that such treaties in those days seemed to be broken regularly I figured they could have decided to stay out if it if they really wanted. I made a small edit to reflect this as you are right it’s an important point. As for the treaty of 1904, the way I see it Bolivia had already lost, there was no way they were getting their land back. For Chile to build them a free railway line must have seemed like a pretty good deal. No one could have known that treaty would be brought up in some high court in Europe almost 150 years later. Without the benefit of hindsight, signing that document was a reasonable move. For what it’s worth I’d like to see Bolivia get their sea back one day. Even they have to build a tunnel under the whole of northern Chile like was proposed some 5 years ago. Thank you for providing a fresh perspective on matters most bolivians are blind to. Despite the absolute madness of the tunnel idea I must admire the creativity around the proposal. These kinds of “solutions” are NO REAL solution to the matter, and though it could be a viable solution for countries with the technological capabilities of say… Japan (or dubai one the island making matter) it is neither a viable solution for the reality of either country nor a real answer to the subject at hand. That aside I’d very much like to talk to you since you have an interesting set of mind. I do believe my email is on your mailing list if not just let me know. For working reasons I now reside in Cochabamba but will be in La Paz over the weekend (this elections weekend) if you care to get together and chat. It is a nice idea, but I agree that a 150 KM tunnel would be so ridiculously expensive it’s not even worth considering. It’s little wonder this project hasn’t been discussed in the media since it was proposed in 2009. I sent you an email with contact details if you want to meet over the weekend. Eduardo Abaroa wasn’t a Bolivian general, nor were most of those 135 people Bolivian soldiers. They were simply Bolivian citizens living in Calama who took up arms against the Chilean military. Also, the demand in the Hague isn’t based on the 1904 peace treaty at all, instead it is based on subsequent actions by Chile offering access to the pacific coast. Finally, a navy is not useless since Bolivia has a multitudes of rivers and lakes (including Lago Titicaca and the Pantanal) in three drainage basins (Amazon, Rio de La Plata and Titicaca) that would still require a trained force to defend. Whether an entire branch of the military is necessary or not is the real question since the navy could be collapsed into the army. Additionally, I believe the Bolivian navy does military exercises in the ocean using other countries’ facilities, this is probably quite useless, but expenses on training for inland bodies of waters is not. That’s what I would have thought, just include lake and river operations as part of the army. Bolivians always fail to address the real causes of the War of the Pacific and how it unfolded. First things first, since modern South American states were just at their birth during the early 19th Century, some if not most borders were grayish zones at best, especially in the unpopulated Atacama region where both Bolivia and Chile had territorial claims. The country that made the most attempts at exploring the region was not actually Bolivia but Chileans, Antofagasta itself was founded as La Chimba by a Chilean miner, Juan Lopez in 1866, and where for much of its Bolivian history, has had a 80% ratio of Chileans within its population. Hence why the Chilean army was acclaimed by the majority when they disembarked on February 14th 1879. The borders were defined by the 1866 Treaty that established the 24th parallel south as their boundary, with Chile renouncing its claims for Antofagasta and the 23rd parallel, and entitled Bolivia and Chile to share in tax revenue on mineral exports out of the territory between the 23rd and 25th parallels. A second treaty in 1874 superseded this, entitling Bolivia to collect full tax revenue between the 23rd and 24th parallels, but fixed tax rates on Chilean companies for 25 years. The problem emanated in 1878-79 when the Hilarion Daza government in La Paz decided to increase the tax rate on the Chilean Antofagasta Nitrate and Railway Company, contrary to the 1874 Treaty but justifying this by the change of government and that the Treaty had not been ratified by the Bolivian Congress. Not only this, but both Bolivia and Peru had been secretly establishing military ties with talks on joining Argentina, and in 1873 signed a mutual Pact of military alliance in Lima. When the Antofagasta Nitrate & Railway Company refused to pay, the Bolivian government threatened to confiscate its property. Chile responded by sending a warship to the area in December 1878. Bolivia announced the seizure and auction of the company on February 14th, 1879. Chile, in turn, threatened that such action would render the border treaty null and void, thus the Chilean Navy intervened that day to halt the auction (which was expected would end in hands of Peruvian interests). After the news of the invasion Antofagasta reached La Paz on February 22nd (pass carnival days as often told in Bolivian mythology) and declared war on February 27th then officially on March 14th with great acclaim, invoking the defensive alliance with Peru and with orders to expel Chilean populations from Bolivian territory and seizing their material and financial possessions. The Chilean army seized this incredible opportunity, where a weaker nation declares war on a stronger one, something only comparable with Hitler declaring war to the USA in 1941, to advance north of the 23rd Parallel and occupying the whole Littoral with little to no resistance, except maybe in Calama. The rest is history, as we can see, much of Bolivia’s fate with the Littoral, and with so many other issues that may have made this country a more prosperous one, lies again with the irresponsibility and right down idiocy, of Bolivian governments like Daza, who it must be said, once the War of the Pacific outcome turned against him, fled to Europe with part of the Bolivian treasury. Thanks for the detailed historical account, Victor. Unfortunately, Bolivia has suffered through many incompetent governments throughout its history.